SideDozer – Seigworth Road Supply, Inc. The GS-ED-60-50 SideDozer is a one of a kind machine. Designed to fit most current and older models of Skid Steer loaders. Older Models may require some custom brackets to mount. The SideDozer has many application possibilities. 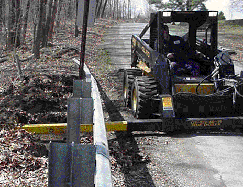 Because of its compact size and maneuverability of the skid steer, clearing under guardrail has become safer(unit quite often does not go beyond the berm into the traffic lane), faster ,and more operator friendly (remains seated while in operation). 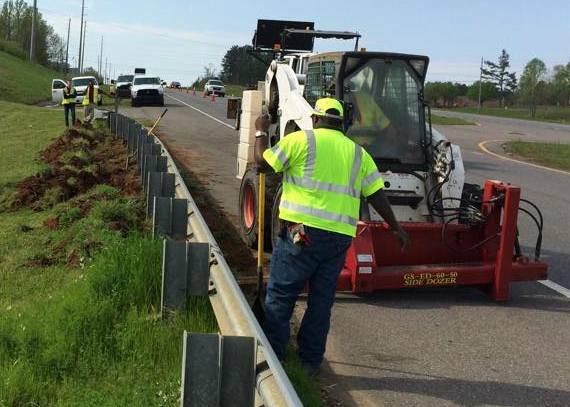 This adds up to less cost per mile of under guardrail cleaning for State Entities, Utilities, and Contractors. The GS-ED-60-50 Sidedozer was designed with the DOT’S in mind and has been improved by help and ideas of some DOT’S. The GS-ED-60-50 SideDozer is also designed for utilities, landscapers, plumbing contractors, and others as a cost savings tool for their operations. 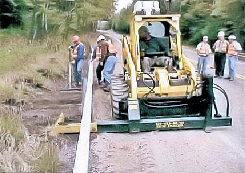 Standard Unit requires quick hitch head on skid steer. Weight of base unit is approx. 1200 lbs. Custom Paint – Unit comes standard painted black with yellow extension tube. Custom Paint includes but not limited to Yellow Unit and Extension Tube, Turnpike Orange Unit and Tube, Dark Green Unit and Tube, and many more options/combos.